Accepting their scholarship awards from Standard Process President Charles C. DuBois (center), are, from left, Courtney Bradenburg, Emily Mickle, Amanda Driscoll, and Trisha Sileo. Chiropractic and nutrition play a key role in a patient’s ability to transform their health. Standard Process Inc. awarded $10,000 in scholarships during the National Chiropractic Legislative Conference (NCLC) held February 24-27, 2016, in Washington, D.C. The scholarships were distributed equally among four Student American Chiropractic Association (SACA) members. 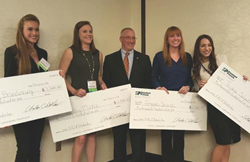 The 2016 scholarship winners are Courtney Brandenburg of Southern California University of Health Sciences, Amanda Driscoll of National University of Health Sciences, Emily Mickle of New York Chiropractic College, and Trisha Sileo of the University of Bridgeport. Standard Process, a visionary leader in whole food nutrient solutions, has awarded the SACA scholarships for the past eight years. The company is dedicated to its long-term educational efforts to involve future health care professionals in the study of whole food nutrition. Thirty-nine applications from 12 different colleges were received, and representatives of Standard Process and the American Chiropractic Association selected the four scholarship winners from the top 11 entries. This year, each scholarship applicant provided a written essay discussing the ways in which the chiropractic profession could support cognitive health in the aging population. be a SACA member able to attend the NCLC. If you are interested in learning more about this scholarship program and others offered by Standard Process, contact Lisa Hackett, professional development coordinator, at 800-848-5061, or by email at lhackett(at)standardprocess.com.